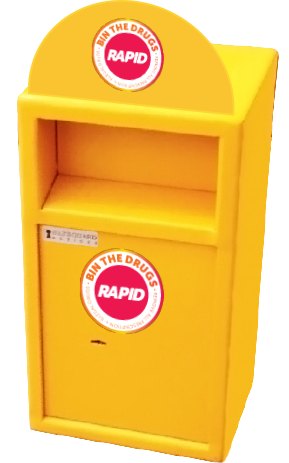 An initiative known as RAPID (Remove All Prescription and Illegal Drugs), which is helping to remove illegal and prescription drugs from our streets by providing drug disposal bins, is to be rolled out across Northern Ireland after a successful pilot. This new initiative is just the latest in a wide range of coordinated action across agencies to reduce harm from the misuse of alcohol and drugs. THERE ARE CURRENTLY 14 BINS IN EXISTENCE, SITED MAINLY IN THE BELFAST, SOUTH EASTERN AND NORTHERN HEALTH AND SOCIAL CARE TRUST (HSCT) AREAS. TO DATE OVER 65,000 TABLETS (OVER 90% OF WHICH HAVE BEEN PRESCRIPTION DRUGS) HAVE BEEN REMOVED FROM OUR STREETS THROUGH THIS PROJECT. The Public Health Agency (PHA) and the Police Service of Northern Ireland (PSNI) will be working closely with local Drug and Alcohol Coordination Teams (DACTs) and Policing and Community Safety Partnerships (PCSPs) to identify and then work with communities and businesses within their catchment areas who may benefit from taking part in the initiative and having a RAPID drug disposal bin installed. Kelly Gilliland, Senior Health Improvement Officer at the PHA, said: “Alcohol and drug misuse is a common issue and causes suffering and ill health to individuals, families and communities in Northern Ireland. Removal of prescription, illegal and new psychoactive substances (often referred to as ‘legal highs’ and now illegal following the introduction of the Psychoactive Substances Act in May 2016) from communities. “Following the regional rebrand and launch yesterday, the aim is that by the end of 2016/17 every trust area will have access to a number of RAPID drug disposal bins,” added Kelly. Drug and Alcohol Coordination Teams and PCSPs will be working together alongside local communities to identify suitable locations where these bins can be installed. 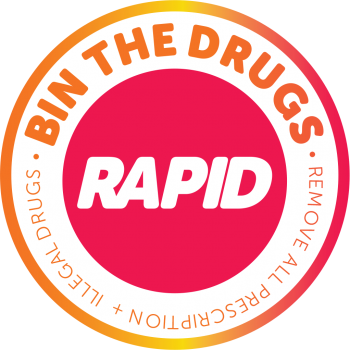 Should you have, or come across, unwanted or unused drugs (whether prescribed or illegal) you are encouraged to deposit them in a RAPID bin safely and discreetly, enabling police to then dispose of them and ensuring that they are out of ‘harm’s way’ for good. PSNI Detective Superintendent Bobby Singleton said: “Having been involved in developing and trialing this partnership initiative from the initial pilot phase, we wholeheartedly support the regional expansion of RAPID and its aim of supporting the removal of illegal and prescription drugs from our streets. “PSNI will empty the bins regularly and will record the information on the drugs deposited before they are destroyed. No personal details are collected. However, substances may be tested by Forensic Science Northern Ireland to identify them and to assess their toxicity.